Please phone us on our direct number 01202 382843 during our working hours. We can then give you advice or arrange to see your pet as necessary. Where are you? – Click here for directions. What if I am away from home when something happens? Just phone us on 01202 382843. We recommend that you download our details onto your phone, or pick up one of cards to keep in your wallet so that in case of an emergency you can contact us easily. Please phone us for an appointment so we can be ready to receive your pet and administer appropriate treatment as soon as possible. Patients will be triaged, prioritised and emergencies will be seen immediately. A call to advise us that you are coming will help us prepare for your pets needs and save valuable seconds. How do I get my pet to you? As all the necessary life saving facilities are only available in the clinic and there is often little we can do to treat your pet at home most pets will need to come to the surgery for treatment. If your pet is injured, we will advise you on how to move them safely so that you can get them to us as soon as possible. • Several taxi driver firms and pet transportation firms may be able to help, though not all work at night. 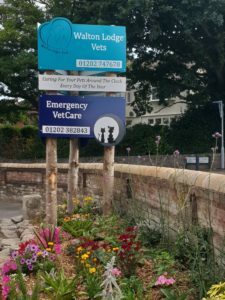 • We may also be able to arrange for a veterinary surgeon to treat your pet at home or bring them to the clinic if necessary. Unfortunately, this service can take some time to set up and so may not be appropriate for every situation. Telephone advice is free of charge. Keeping a clinic open out-of-hours and providing excellent care and facilities is by its very nature expensive, however, we endeavour to keep our fees as low as possible. Click here for more details. What happens if I have to leave my pet with you? If your pet needs ongoing investigations, monitoring or treatment, we will need to admit them to the clinic. We are fully aware that pets are members of the family and they will be treated as if they were our own. There is always someone to look after them so they will never be left alone. We usually arrange telephone update times so you are not anxiously waiting for a call, but feel free to call us at any time. 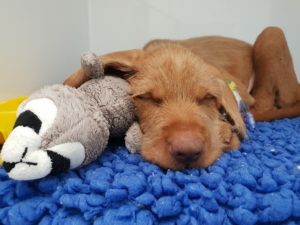 If my pet is admitted overnight, what happens the next day? In the morning, so long as your pet is able to travel, your pet will go back to your usual surgery so where your own vet will take over their care. A copy of their records and any results (radiographs, blood tests etc.) will go with them. What do I do in an emergency while bringing my pet to you? 2. Contact us as soon as possible, to obtain first aid advice and to allow us to prepare for your arrival. 3. Keep your pet warm (unless you suspect heatstroke), as quiet as possible, and keep movement to a minimum if there is possible injury, e.g. broken limbs etc. 4. Transport your pet to us as soon as possible but drive carefully and observe speed limits. 5. If the pet is small enough, try to transport in a suitable container such as a strong cardboard box. If it is a large dog try to obtain a blanket or thick towel on which he can be rolled and then lifted by one or more people assisting. Improvised stretchers using boards, doors etc. should be used with care – the recumbent patient can sometimes ‘come to’ and jump off and sustain further injuries.